2 + 4 = Required Please enter the correct value. A sudden and dramatic spike in the Bitcoin price has pundits everywhere hunting for an explanation. While the price of Bitcoin had fared well over the past 12 months, more than doubling from the lows of last August, the latest surge pushed the digital currency to a two-year high. Once the Bitcoin price broke through resistance at $460, a level that had served as a barrier over and over since December, it raced to $500 and beyond. A week ago, the Bitcoin price was about $445. Starting on Friday, the price of Bitcoin began to move up. It breached $500 on Saturday and $540 on Sunday. The Bitcoin price has leveled off and pulled back a little since, but today (Tuesday) is hovering around $530. At the peak of the run, the price of Bitcoin had soared more than 20% in just three days. Bitcoin buying in China suddenly increased in recent days. 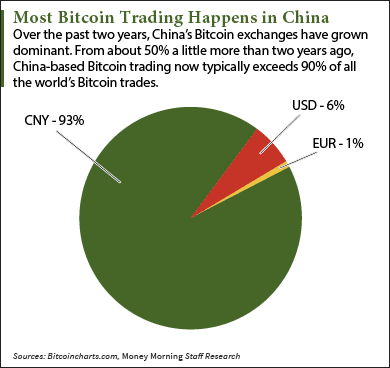 And make no mistake, China dominates world Bitcoin trading. Many people don't realize China's importance to the Bitcoin ecosystem. Despite restrictions imposed in 2014, the Chinese government never banned Bitcoin outright. China-based Bitcoin miners account for about three-quarters of all Bitcoin miners. Over the past 30 days, trading between Bitcoin and the Chinese yuan has accounted for 93% of all Bitcoin trades, according to Bitcoincharts.com. By comparison, trading between Bitcoin and the U.S. dollar accounted for just 6%. As volume spiked on Friday and Saturday, the Bitcoin price on the Chinese Bitcoin exchanges raced ahead of prices in other currencies. At one point the spread between Chinese Bitcoin exchange Huobi and the London-based Bitstamp Bitcoin exchange was $70. As Bitcoin prices worldwide caught up, the spread shrank. As of today, that spread is about $14. So there's no doubt that Chinese traders drive Bitcoin prices. Buy why are the Chinese buying Bitcoin now? Some underlying forces driving China's appetite for Bitcoin have been true for a long time, but several things have happened recently to push demand higher. For example, Bitcoin is an ideal way for the Chinese to evade their government's use of capital controls to restrict yuan from leaving the country. Once yuan are converted to Bitcoin, the money can be sent virtually anywhere in the world. The Chinese also enjoy speculation and gambling, which is one reason Bitcoin became an instant hit there back in 2013. In China, Bitcoin is more widely viewed as an investment that will at some point deliver a big payoff. Likewise, Chinese investors are always hunting for the best returns, and quickly sour on underperforming classes. When the Chinese real estate market started to tank, this group bailed. In the past year, such asset classes as commodities and stocks have also disappointed. That's steadily pushed more yuan into Bitcoin, particularly in recent months. Less supply, higher prices: Most people who follow Bitcoin are aware that the reward earned by the miners for solving a block will drop in half July 11, from 25 bitcoins to just 12.5. The 50% decline in supply in the face of rising demand will put upward pressure on the Bitcoin price, and Chinese investors know it. Weak yuan: A weaker yuan, particularly against the U.S. dollar, is bad news for wealthy Chinese who hold a lot of yuan. The surprise devaluation of the yuan last summer put Chinese investors on notice. And lately, they've had more to worry about. The yuan fell 1.6% against the greenback in May, its biggest one-month drop since last August. It now sits at a five-year low. And with the Chinese economy continuing to slow, more yuan devaluations are probably in the cards. Chinese concerned about losing value see a safe haven in Bitcoin. By converting yuan to Bitcoin, they not only avoid losing value as the yuan weakens, but gain value as the Bitcoin price rises. 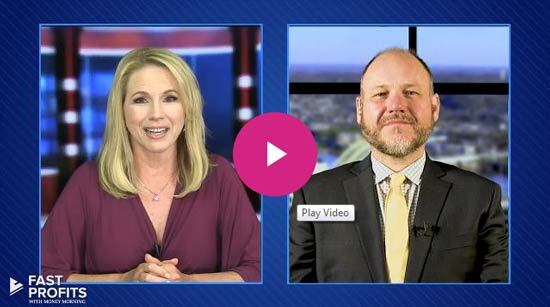 A Fed rate hike: In the past week, the yuan got more bad news: the increasing possibility of another U.S. Federal Reserve rate hike, perhaps just weeks away. A Fed rate hike will further strengthen the dollar, adding to the downward pressure on the yuan. Several Fed governors have been making "hawkish" speeches lately. But a comment from Fed Chair Janet Yellen on Friday could have been the spark that pushed the recent Bitcoin-buying frenzy to new heights. "It's appropriate … for the Fed to gradually and cautiously increase our overnight interest rate over time, and probably in the coming months such a move would be appropriate," Yellen said in a talk at Harvard University. At that point, the Bitcoin price had moved up, but hesitated at about $475. Hours after the Yellen speech, the Bitcoin price started to take off. OK, so the Chinese are buying Bitcoin. What happens now? Wider demand for Bitcoin will continue to grow, driven mainly by the digital currency's ability to disrupt the financial industry. And supply will continue to shrink. The halving of the reward in July is the third in Bitcoin's history. Future halvings will occur every three to four years until Bitcoin reaches its 21 million-coin limit in 2140. The increasing pervasiveness of Bitcoin and its underlying technology, the blockchain, will continue to drive the Bitcoin price higher over time. There will be pullbacks, of course, but the long-term trend will be positive. That's why two Wall Street firms have high expectations for the price of Bitcoin in the coming years. Needham & Co. sees Bitcoin going to $1,896 by 2020. And Wedbush Securities has estimated Bitcoin will reach $17,473 by 2025. The Bottom Line: The sudden, 20% jump in the Bitcoin price over the past week can be traced back to buying in China. The Chinese became interested in the digital currency back in 2013 and now are responsible for more than 90% of the world's Bitcoin trading. 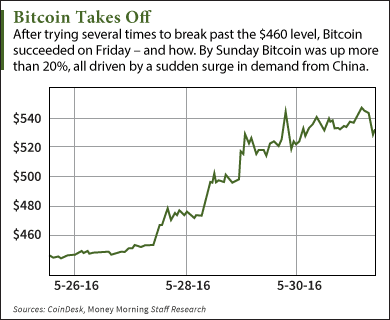 Economic trouble in China almost always leads to a spike in Bitcoin. And with the yuan under increasing pressure lately, it should be no surprise that the Bitcoin price is surging. BTC's primary trading spot is the U.S. China volume almost entirely fabricated by zero-trading fee exchanged and robot traders – some run by the exchange itself. This has been proved many dozens of times over. Please stop reporting this as "fact".